Rhode Island State Police Headquarters | SIGNET Electronic Systems, Inc. It has been over 50 years since the antiquated Rhode Island State Police Headquarters was built in 1960. In these 50 years major advancements in technology and building design have emerged. The new Rhode Island State Police Headquarters would need to include the highest levels of data, audio-video, camera surveillance, and security technology to not only meet today’s needs, but also future proof tomorrow’s demands. The new 56,000 SF state-of-the-art Rhode Island State Police Headquarters would also be the new home to the Rhode Island E-911 Call Center, consolidate two operational barracks, and in addition support office departments such as the Criminal Investigation Unit (CIU), Bureau of Criminal Identification (BCI), and Patrol, Detective & Administrative Bureaus. Other highlights of the building design were the inclusion of the E-911 Emergency Call Center new main headquarters, as well as a press and conference center and a detainee processing and holding center. The project was designed to include requirements that a single systems integrator perform all of the low voltage scopes of work. By having one company responsible for all low voltage systems alleviated any traditional finger-pointing, which may occur on other projects with multiple vendors installing multiple systems. In the long run, this would prove not only more efficient, but also offer greater integration options between all the various systems as they could now be engineered as a collective rather than independent systems. Highlights of the project included a complete Structured Data/Voice Cabling System, campus-wide Fiber Backbone Cabling, a fully Integrated IP Access Control, Video Surveillance, Cell Audio Detection, Intercom and Paging System, Audio Visual, and a GPS Wireless Clock System. Without question, SIGNET was the clear choice to perform a seamless installation crossing the variety of low voltage disciplines. SIGNET’s project team worked in collaboration with General Contractor, A.F. Lusi Construction, Inc. and owner’s representative, W.E. Marchetti Consulting, LLC, SIGNET successfully completed the challenging $1.6 million dollar Integrated Security, Communication infrastructure, Audio Visual and Technology System project. To meet the campus’ security requirements, SIGNET installed a large Genetec CCTV and integrated Hirsch access control system including approximately (100) card readers with combination scramble pads, (85) IP fixed and PTZ CCTV cameras, and (10) video and access control monitoring workstations. Genetec and Hirsch, both leaders in the industry, were chosen due to their integration capabilities and scalability. Understanding the State of Rhode Island may want to expand their systems to other barracks, both Genetec and Hirsch will support this growth. The integration between the systems allows for alarm events to populate across both systems and call up specific camera views isolating the alarm. Retrieving video is also easier as the alarm events are “tagged” in the video archive. Intercom locations and door alarms force camera call-ups, while cells support audio threshold detection and talkback features. SIGNET also leveraged Hirsch’s “mantrap” capabilities to provide a customized cell block area with duress code lock-down features. The systems were installed on a dedicated security network to increase efficiency and system resiliency. 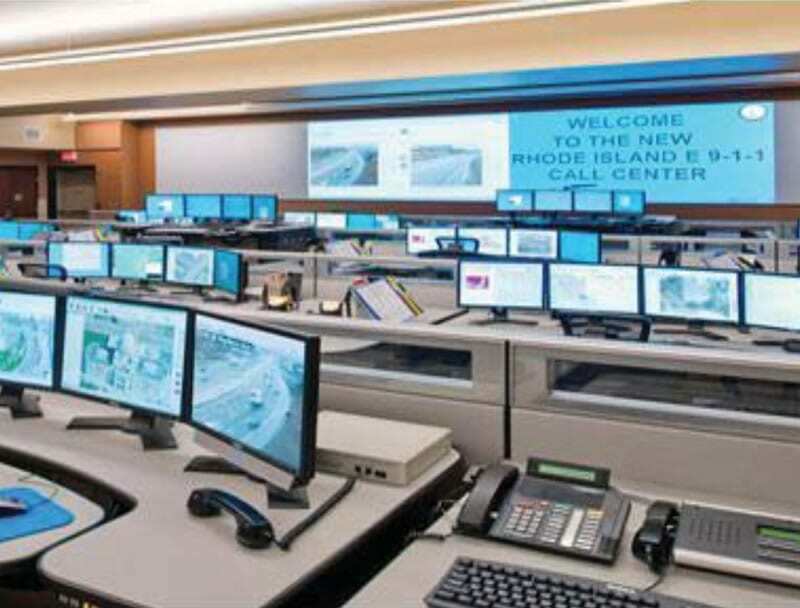 To meet the State Police’s requirement for enhanced conferencing abilities, demonstration, and state of emergency call center needs SIGNET provided state-of-the-art audio visual systems for seven rooms, including the headquarters’dispatch center. The audio visual systems were anchored by a Crestron control system with wireless touchscreen control stations. A large video wall in dispatch combines a set of four independent 46” LCD monitors into one large 7’ x 4’ video display. The E-911 call center has multiple projectors displaying critical information on a 40 foot projection screen. SIGNET’s engineering team, leveraging the abilities of the AV systems, also provided a no cost solution to interface the buildings IP video system with the audio visual system so specific or all building cameras are viewable on the dispatch video wall. Finally, to future proof the communications throughout the campus, SIGNET provided a category 6 structured cabling information superhighway capable of full gigabit 1000baseT performance. Enhancing the efficiency and backbone support of the copper station cabling, SIGNET installed over (450) strands of multi-mode and single-mode fiber optic backbone, as well as multi-pair copper between all closets to continue support of legacy systems. All category 6 cabling is backed by our Hubbell 25 year mission critical warranty. The Rhode Island State Police are now enjoying a truly state-of-the-art and modern headquarters capable of increasing not only the efficiency and safety of their own personnel, but also that of the residents of Rhode Island. SIGNET is proud to be able to offer true diversified and unified systems integration to help increase your efficiency and safety.